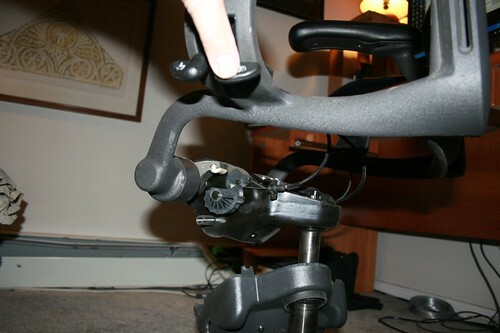 How to Repair a Herman Miller Aeron Chair | Planet Geek test site. First and foremost, I don’t recommend anyone who isn’t comfortable crawling around on the floor, and possessing a decent set of tools to attempt these sorts of repairs. The Aeron chair is built with an eye toward long term maintenance and durability. It has Real Live Parts in it, so you should use Real Live Tools to work on it. Since the problem I was having was with the recline mechanism, I traced the cables from the levers. They disappear into that formless box underneath the seat. After some wriggling around, I decided I needed to remove the seat to get better access to it. Much of the chair is held together with allen-head bolts, so having a good set of standard-sized allen wrenches is required. 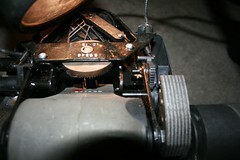 Remove the two bolts from the sides of the pan, and remove the two bolts at the end of the arms under the mechanism box. They came out easily for me, but they were obviously snugged in. Once those bolts are out, pull the seat out and set it aside. The next step is getting the box open. It’s a plastic housing that has only 2 screws visible on the outside – a set of phillips head screws on the bottom. Don’t undo those yet. The plastic housing is one of those ‘snapped together’ arrangements. I had the benefit of having the housing loose already, so a little prying and wriggling with a large flathead screwdriver, and the whole assembly popped apart. This is fairly rigid plastic, so don’t twist, you could break off the tabs, but gentle pressure around the joining edges will win out, and the top will pop off. Once the top is off, you can see the mechanism inside. For the problem I was working on, I needed to reach the underside, so I undid the two phillips head screws, and pulled the bottom cover off. These screws, by the way, are sheet metal screws, not mechanical screws. They thread into the metal of the chair. Don’t lose them! The chair mechanism is remarkably simple, and made sense once I looked at it. It was obvious that the two levers control the distance the chair can tilt one way or the other, using a set-bolt on one side, and a rotating cam on the other. 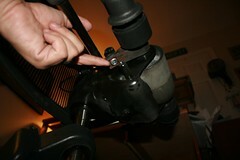 The rotating cam designates how far back the chair will tilt, the bolt sets where the forward tilt stops. While wiggling the cables around, I realized that the tilt mechanism had gotten jammed with the forward tilt saying “FURTHER BACK” and the back tilt saying “FURTHER FORWARD”. The only way to unjam these was to take pressure off one side of the mechanism so they could rotate. But how to do that? The answer came in the set bolt under the forward tilt. There’s a massive assembly there (for a chair) obviously taking all the pressure for the forward tilt. It has a large (allen-headed) set bolt, accessible from the bottom, that can be used to adjust the ‘stop point’. I set my largest wrench into that bolt, and backed off the tension 1, 2, and… POP! Something moved. Looking to the other side of the tilt mechanism, I had relieved enough tension that the recliner cam had snapped back to where it was supposed to be. Now the levers were operating properly! I could slide the recline lever up and down and see the cam rotate from one side to the other. Score! Note the position of the cam – when it’s spun ‘out of the way’, the chair can recline. After puttering around inside for a little, getting an idea how the tensioner for the recline mechanism works (it’s a lateral screw driving a spring – maybe I’ve worn out my spring, because running the tension from stop to stop via the knob on the side never really did anything), I decided it was time to pack up. Reassembling was relatively easy, except for getting the panel screws back in place. Remember, not mechanical screws, and in an awkward location. The answer came when i figured out you could see through the mechanism to where the screw was attempting to thread into the mount. A bright light down there and I was able to line up the screw properly. Reassembly was easy – two screws to put back on the lower housing – be careful to lay the control cables back into their slots, or else the housing won’t go together correctly. 4 bolts to put the seat pan back in place, and I was done. I am very impressed with the construction of the chair. It has solid, well designed parts all the way through it. This sort of repair / issue with a cheaper office chair would have meant me throwing it out and likely replacing it with a new one, but Herman Miller did well with these things, and repairs are quite possible and worthwhile. My chair is back to being it’s normal comfy self. If you bought your Aeron Chair off ebay, how were you able to get the seat replaced under warranty if you aren’t the original purchaser? The vendor selling on ebay warrantied the sale. 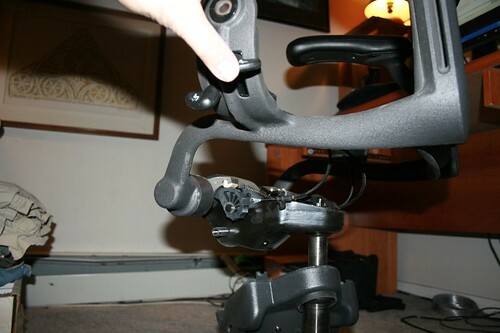 have just repaired the hight adjuster on my Herman Miller Mira chair by following your post. Thanks! @russ Awesome! Glad I could help. Thank you very much for this post. I had the same issue and just repaired it instead of sitting here grumpy. How do you fix the height adjuster on the Herman miller chair?? It’s the piece between the box itself and the apparatus that houses the backrest and the chair controls. This was an almost spot-on do-it-yourself guide. 2) After taking out the seat and removing the control cables out of their respective slotted housings, I was able to apply pressure to the back of the chair slowly, forward and back, until I was able to see which of the two cables was the bigger problem (in my case, it was the recliner. Once that gave and the recline stop relaxed, I was able to return the chair to normal operation. I have a slightly different problem with my new Aeron. The thing is that I prefer to sit straight up when working. When I use the STOP tilt to lock backward tilt, it still moves back a bit and does not stay in the straight position it is in normally. Can you tell me which screw I need to adjust this? Is this something that can be repaired or should I purchase another one? As far as warranty goes, it’s only about 6 years old but I don’t have my receipt anymore. BLESS YOU AND THANK YOU!!! I was about to attempt that very repair without aid, but am so happy to have found your blog. I have been sitting unable to recline for a couple of years now!!! I’m going to give it a try. . .
Well, I only got as far as the screws on the side of the pan: a technical screw driver is required on the bolt… a large one–#30ish–which I will have to purchase. OK. 2 B Expected. Thanks. will try to update my status. Just want to say thanks much for this post. My issue wasn’t with back tilt, but forward tilt. The chair was stuck in forward tilt and would not go back level. Your tut got me into the guts and to adjust the large bolt beneath which made the mechanism work again. Thank you for this tutorial. I reecntly purchased a used aeron at a garage sale whose tilt controls were broken. I was able to adjust the back tilt, but now it seems the forward tilt still does not adjust. I was unable to determine how the mechanism worked. Can anyone provide more information on how this works? I have a different problem that I’m having trouble finding any info on. There’s an abandoned Aeron at work that has a large rod with notches on the bottom falling out of the bottom of the hydraulic cylinder. Anyone familiar with this problem? I have one Aeron at home (size A – about 6 years old) and one at work (size B – about 10 years old). Both are the original black. After about 5-6 years, pieces of black spongey debris have appeared on the floor under the chair. The source appears to be black foam insulation/padding that has disintegrated from its position under the front edge of the seat, between the frame and the mesh seat. Has this happened to anyone else’s chair? I had a size B aeron chair here in London, UK. The seat mesh had a big rip in and decided after being uncomfortable for over a month to get it fixed. I phoned Herman Miller and the cost was ridiculous. I found two companies that could fix for almost half the price. One was http://www.chairdoctor.co.uk and the other was http://www.wesellusedaerons.co.uk. I just fixed a jammed forward motion lever by snapping off the cover using the trick used on this video – http://www.youtube.com/watch?v=ivuOxLxuQzo#t=1m57s – untightening the recline screw on the right hand side of the chair and liberally spraying the mechanism where the cable ends up (with the spring on it) with WD-40. I then turned the chair back over, sat on it, wiggled back and forward a couple of times and presto, it was cleared. Thanks for your help though, it inspired me to try some DIY and it worked!